This month farmers in Bali are in a period of paddy planting. Because the season is very supportive with appropriate rain. In the picture, it looks very beautiful rice fields. 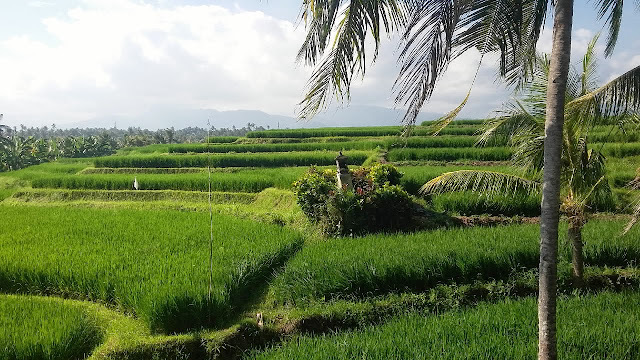 Rice fields in the picture is in Yehembang, Jembrana, not in Jatiluwih. 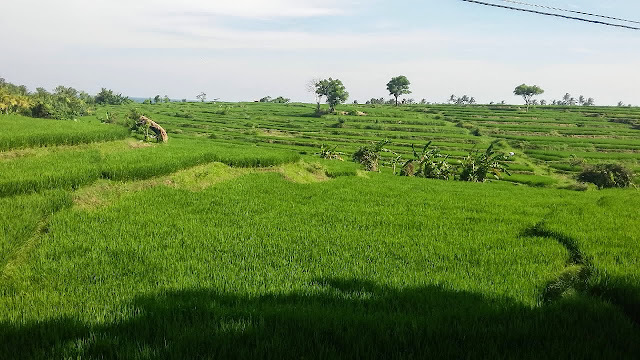 Jembrana also has a vast expanse of paddy fields and beautiful. Rice fields on the edge of the image is in the Denpasar-Gilimanuk highway. The fields that exist in Jembrana not as beautiful in Jatiluwih and Ubud. Since most of the rice fields in the lowlands, with the contour of the land is more flat. In contrast to existing in Ubud. Rice paddies in Ubud look more beautiful, terraced with a stretch of palm plantations and rivers. That's because the land in the area in Ubud are hills and mountains. So the terraced rice fields made following the contour of the land is hilly and valley. Farmers have to deal with the existing land by making levels in every hillside, so that it can be used for planting in the morning. Jembrana is a flat area, but has a mountain closer. Lowlands to the mountains has the distinction lies very close. If heading to the mountains, from the lowland going straight uphill. This complicates the management of water. Although Jembrana is an agricultural and plantation area with a sufficient amount of water, but residents who live mountainous region is more difficult to get water. Because the water is in the valley and the mountain pass. Terraced rice paddies in Jembrana is not so well known. Because the district of Jembrana is not a tourist destination. Although there are many villas, yet mostly located in coastal areas. Terraced rice paddies in Jembrana is located in the interior. In the isolated village by public access. So the terraced rice fields in Jembrana unknown to outsiders. 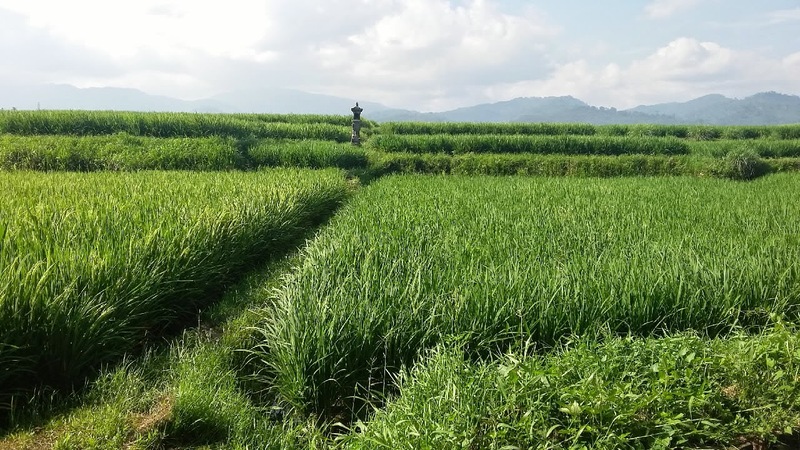 One of the best places with views of the vast green paddy fields and is located in the village of Yehembang. Starting from the west around the village of Penyaringan and Tembles, to the east in the village of Yehembang in around of Rambutsiwi. On the east of Rambutsiwi, on the edge of Denpasar-Gilimanuk highway, there are vast rice fields and beautiful views.